Meeting 1: Layout - We get your ideas and together we come up with a strategy and feel for your commercial before we ever even shoot something, this way you know exactly what you are getting! Meeting 2: Shooting - We come to the designated shooting locations and shoot the footage for your video. Editing: This is where we finish the commercial per the specifications we determined in Meeting 1, but don't worry if it does not feel they way you want, it's your baby, we offer 3 complimentary adjustments. Promotional Videos are a great way to call attention to your business, special project or event. With the nature of these videos, we must meet to discuss all aspects. Everything there after - Dependent on Project. We can transfer any video format to another, whether it’s VHS, VHS-C, 8mm, Mini-DV, Beta-Max*, DV, D9, and so on. Please allow for a 3 week turn-around, quicker turn-arounds can be done, but will have a rush fee of $30 added to total cost. We offer a variety of editing options to suit what you need; we will first have consultation meeting with you so that no wasted time will be spent on editing your project. Editing can be a very time consuming venture so this will only aid you in the long run. Editing Pricing: $50 an hour; 1 hour minimum. 35mm: Determined based on Job. 5mm – Determined based on Job. Thinking you need to put in some video equipment but not sure what you need? We offer on-location consulting for all your needs! We even can sell the equipment to you. Have a DVD that you want copies of? We’ll happily take on that project! 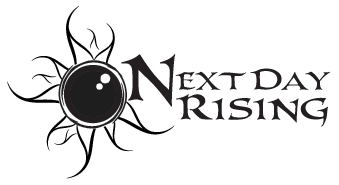 Contents © 2019 Next Day Rising • Site Provided By: Day One Web, Inc.